Antique Mystic at Oedo Antique Market! Everyone has their own little guilty pleasure in collecting things. For some people it could be little things stamps, hair clips, or pins. For others, it could be a slightly bigger investment with things like vases, scrolls, or first edition books. 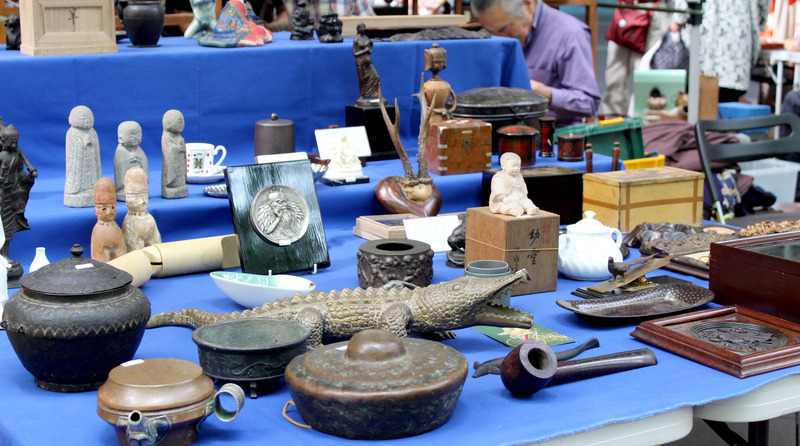 Whatever kind of collector you are, there’s something for everyone at the Oedo Antique Market! 1) I went on the 1st Sunday of September (September 3rd) but found out it wasn’t to be held until the 17th (the 3rd Sunday). The 2nd time it was to be held on the 24th (the 4th Sunday) So that means that for September it wasn’t held on the 1st/3rd Sunday but the 3rd/4th, contradictory to what the website says. 2) Rain! I tried to go to the market on the 17th but it was cancelled due to pouring rain caused by Typhoon Talim sweeping across Japan. Vendors at the market aren’t under any roofing and very few of them use tents. Many items protrude outwards from their tents as well. So any chance of rain runs the risk of having the market close up shop for that day. 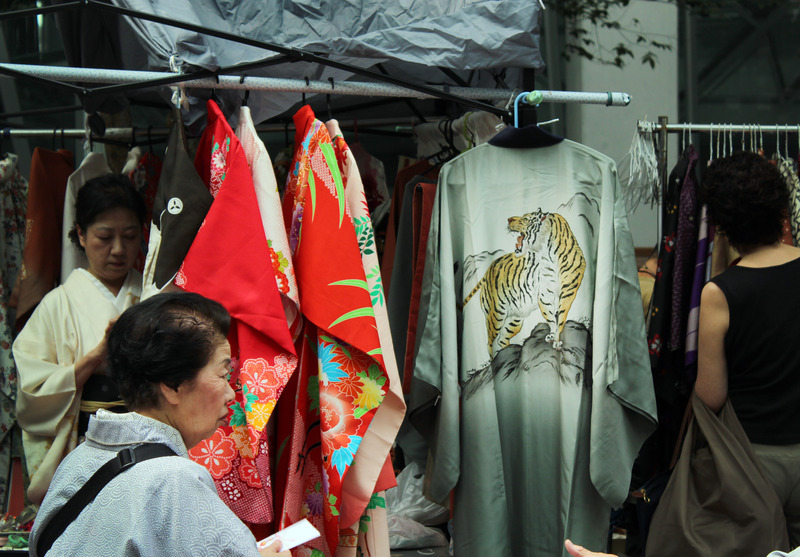 The Oedo Antique Market is also held at Yoyogi Park once a month and at a smaller scale with 150 dealers. It’s still admission free and runs for a little longer (8:00 – 16:00). Again, be sure to check dates! Since this is smaller version of the main event, it’s not held as often and doesn’t seem to follow the “1st/3rd Sunday” pattern, and the market will not be held here in October and November (2017). 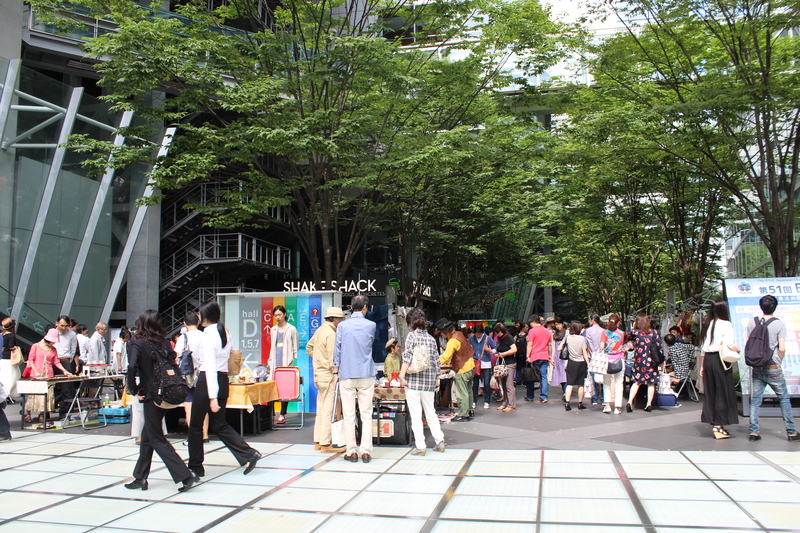 The Oedo Antique Market (Tokyo International Forum) is held directly in the heart of Tokyo! Getting off at JR/Metro Tokyo Station, it would be a 5 minute walk way. If you get off at JR Yurakucho Station, it’s almost directly out of the station with just a minute of walking. 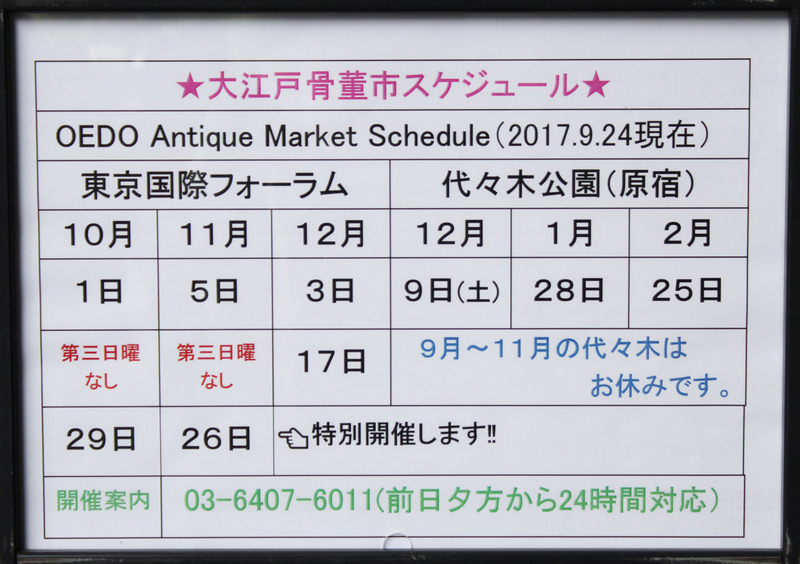 For the smaller antique market (Yoyogi Park), it’s a 5 minute walk from either JR Harajuku Station or Metro Meiji Jingu Mae Station! In at a nutshell, what you can find at this market is an endless supply of very traditional Japanese items, like traditional pattern kimonos, intricately designed plates, handcrafted picture frames, and things of that like. I think it’s a great place for the history buffs, especially those who are interested in Japanese history! There are scrolls/paintings that imitate the art style of the Heian period, books on ukiyo-e (Japanese woodblock prints), and mini Buddha statues where the designs differ based on era. These kimono’s have intricate design work and tend to have more pale dusty colors instead of brighter ones. The price differs depending on vendor, though some are definitely a steal! (I.e. 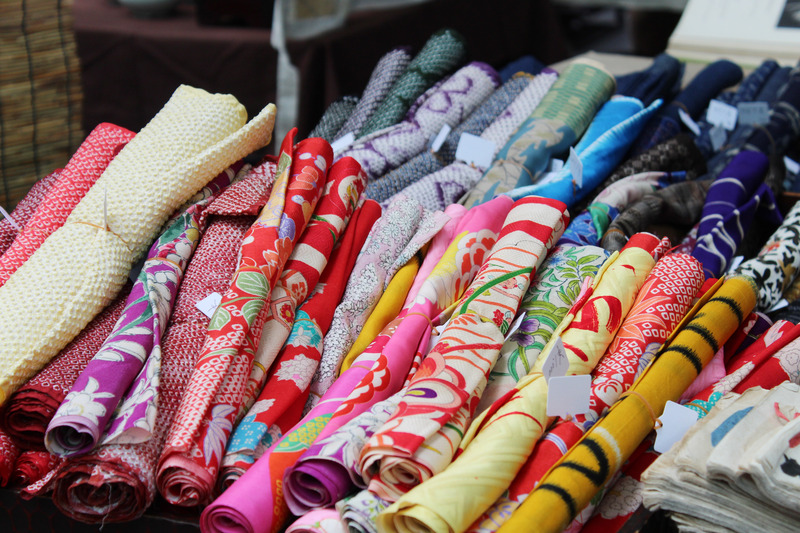 One vendor was selling a kimono set at a discount price of 2,000 yen). 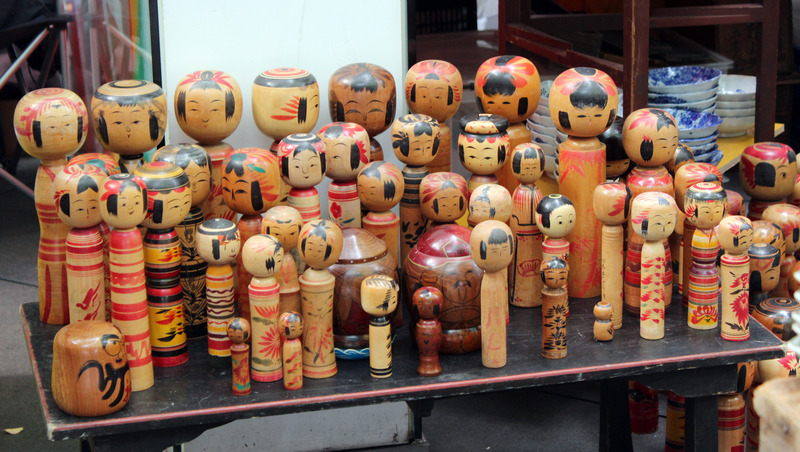 Kokeshi dolls were abundant at the market, varying in design and style! They’re cute and light weight, and cheaper than most other items at the market. The price can range from 700 yen - 2,000 yen+. There was an endless supply of rather traditional Japanese design fabric, most of them displaying either floral patterns or Heian ideals of beauty. Many of them were poster sized and can easily be rolled up and wrapped to bring along with you. There were many statues (big and small) of Buddhist figures, animals, things of the like. There were even coins that had intricately carved designs on them. Some plated with silver and gold! Considering this is an “antique” market, prices are definitely higher than normal. Some of the cheapest things you can find are small plates around 300 – 700 yen, or little toy packets for children (in which the contents can be found cheaper at Daiso). 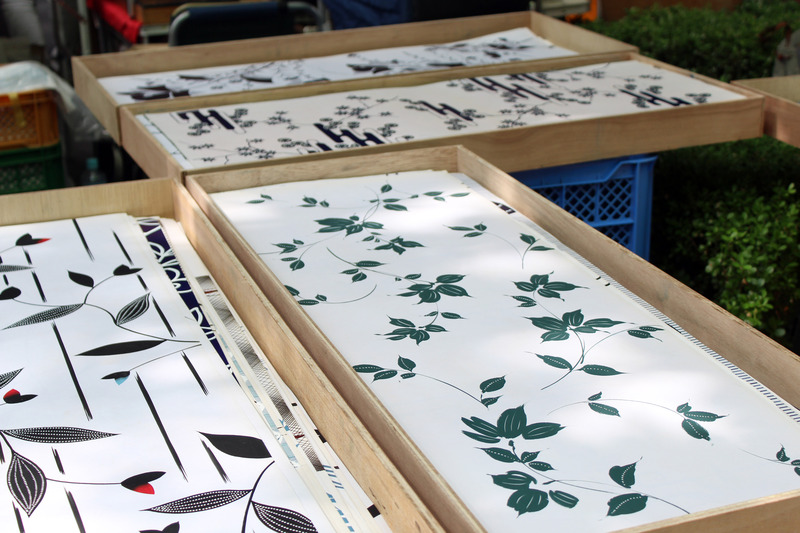 Then, there are the scrolls, artworks, kimonos, fabrics, that range from 2,000 yen – 5,000 yen+. Once we get to statues, figures, and collectable coins, the prices sky rocket. I saw prices that went from 20,000 yen to as high as 50,000 yen. Taking into account the fact that this is an outdoor market, I don’t think any vendor takes card payment despite the high prices (although, I didn’t ask). And I honestly do wonder if anyone comes to the market and makes a huge transactions in cold hard cash. But, another thing to keep in mind: be sure to have your cash on you just in case something catches your eye! I think the items you can find at this market could be great for your own personal collection, your [Japanese] history buff friend, or as a gift to someone who takes genuine interest in vintage items. However, it’s not the best place for mass souvenir shopping since many of the items are fragile, expensive, and heavy. It could be a pain to pack into your bags, especially since the items will inevitably need cushioning to prevent damage from airport shuffle and tussle. If you do decide to do a little shopping here though, I recommend bringing a bag or small suitcase/luggage bag to carry your items. Again, these are fragile and expensive items. The trek from the market to your designated station can be a long and arduous one if you’re constantly worrying if your items will survive the trek! It would also be a good idea to avoid rush hours (early mornings, midday, and after-work rush) and packed trains to keep your items safe and sound.